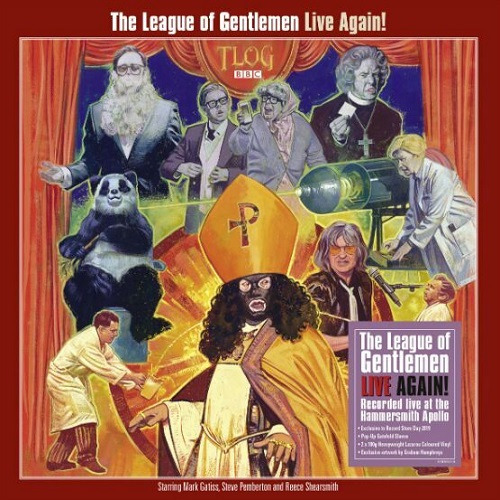 Home / The League of Gentlemen - Live Again! Double 180 Gram Coloured Vinyl. Welcome back to Royston Vasey. Available exclusively to Record Store Day on vinyl, Demon Records proudly present The League Of Gentlemen ‘Live Again’. Following 2017’s 20th anniversary TV specials, the League embarked upon an enormous UK tour taking their uniquely sinister characters across the country for one last lap. This recording of the BAFTA Award winning show sees comedy legends Reece Shearsmith, Steve Pemberton, Mark Gatiss and Jeremy Dyson bringing their uniquely dark and unhinged fictional village of Royston Vasey to the Hammersmith Apollo. “I’m so eccited to take my preshus things on tour agen I did a little brown fish!” says Tubbs Tattsyrup Created in conjunction with the League Of Gentlemen, and featuring beautiful original artwork by horror legend Graham Humphreys, ‘Live Again’ is pressed on Double 180 Gram heavyweight coloured vinyl, and is presented in an incredible pop up gatefold sleeve featuring key characters Pauline and Mickey. Featuring all of the classic characters from the show including Tubbs and Edward, Papa Lazarous, Les McQueen, Dr Chinnery, Charlie and Stella, Pam Douve, Hilary Briss, the reverend Bernice Woodall and more. You’ll never leave!! !